Do you know someone worthy of an SCA award? Someone who deserves recognition for their outstanding medieval recreations or plentiful service? If you do you can help them out by writing an award recommendation. Yes, you can do this. Anyone can submit one. In Calontir the easiest way to do this is by the Online Award Recommendation Form. Much simpler than writing a formal recommendation letter and snail-mailing it, like back in the day. Awards offer people admission into Their Majesties orders. They are considered by the current Majesties for what the recipient has done, not on who you are. Even so, you are an important link in the recommendation process. Without you, Their Majesties may never learn the work your friend has done. Or the beautiful recreations you've seen someone else make. Monarchs have their own ways to determine who receives awards during their reign and varies between them. So if you submitted a recommendation for someone once, do it again if they didn't receive it. You help both Their Majesties and the recipient by providing the detailed information. 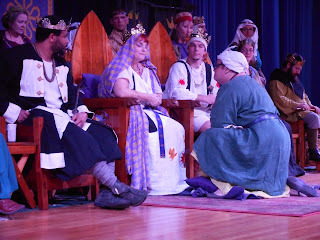 In Calontir Monarch's plan their reign soon after they become heirs. They attend order meetings to learn candidates' accomplishments. For AoA level awards the best time to submit, but not the only time, is soon after Their Majesties assume the throne. Be sure to submit an AoA recommendation at least two months prior to an event you guess your person will attend. Begin by looking up your recipient's name in the Calontir online Order of Precedence (OP). It's easier to do this beforehand but if you don't there's a link on the online award rec webpage. Here you confirm if your friend already has the award. It doesn't look good but it happens someone gets an award twice. On the form, there are details required about who you and the recipient are. 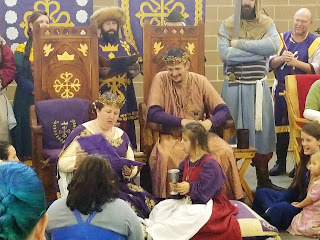 You must give your recipients full SCA name or else Their Majesties can't even have a scroll made. But also you give your SCA name, modern name, phone number, and email. This provides Their Majesties a way to clarify any questions they have about your submission. Additional personal information helps if there are confusions about the recipient or the award. You'll want to describe in detail your intended recipient's accomplishments. Depending on the award and person you could include offices, local awards and any factors causing you to believe your friend or acquaintance should be given the award. If you have dates, you should use them. If you include comments others have made say who spoke them. Don't include anonymous statements. Be persuasive without exaggerating what the recipient has done. Consider also people who came from other local groups or kingdoms. You can look up online what they did prior to your meeting them and include that in your recommendation. I've been asked if you can write a recommendation for your lord or lady. If you feel they deserve it, of course, you can. Who else knows their efforts better than you? If you do, it is proper to disclose your relationship even though this is an online form. In the SCA and Calontir, some people are given awards because they contributed to the dream in many small ways over an extended time. If you are recommending someone for such an accomplishment don't overlook even minor ways they have been helpful or inspiring. If this is huge you might ask several others to write recommendations for the same award. Write that award recommendation today. The sooner the better. You may submit the deciding factor helping Their Majesties present a deserving subject an award they'll cherish forever. Perplexing Pictures In Manuscripts 5. I was surfing the British Library's manuscript collection again for possible pictures to use on a scroll and noticed the cute bunnies in the manuscripts. Especially in the 14th century. So many, they weirdly multiplied like rabbits. But another thing you'll notice is how peculiarly violent some are. Beyond the pure and helpless ones, there are perplexing bunny revenge pictures. Marginalia with bunnies attacking dogs, shooting arrows at humans, jousting at knights or simply thumbing their bunny-nose at authority. Seems like wishful thinking on the bunny's part. But an attacking illumination bunny may illustrate the person in the story is a coward, stupid or as meek as a lamb. Or the bunny may be warning you that "what comes around, goes around" and may bite you in the end. There are many ways you can interpret the images. It is strange to me why a Medieval scribe would excruciatingly detail pictures in a manuscript then bizarrely include weird, crude bunny and other images in the near-by margins. Though perplexing the revenge bunnies do amuse me as they probably did the Medieval reader too. But be careful which bunny images you choose to use in your scroll as their meaning may be construed as different than what they appear to show. For Medieval scribes, the margins were a safe space where they could critique and question society. Is that what you want to do? So next time you're curiously surfing the internet for scroll inspiration see what you find Medieval bunnies doing, perplexing though they may be. You can see others in my series Perplexing Pictures In Manuscripts: 1, 2, 3, 4. You asked for it. My arm was twisted again. I'll be teaching my "Playing With Powdered Pigments" class at the coming November 3rd Book Arts RUSH classes. I was asked to teach it at two prior Calontir Lilies War RUSH sessions, but I couldn't. The location wasn't appropriate. A little wind gust would quickly swirl away the powders wasting them or worse causing you to possibly inhale them. Neither a good idea. 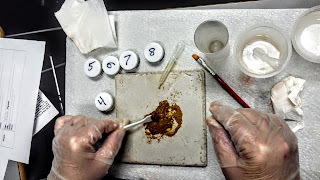 Dealing with pigment powders may be harmful if not handled carefully. Your safety is important to me. 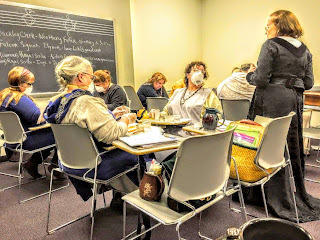 While I don't use toxic pigments in this class, learning safe methods is important because even non-toxic dust can be harmful when inhaled. And repeated exposure to them may cause irritation leading to actual harm. If you breathe in pigments or they get into your mouth they can enter your body. If you have a cut or scratch they can penetrate your skin and be absorbed. Any of these methods may cause you a health problem, even if you aren't allergic or have a predisposing condition. It's always important to know and follow safe art procedures in any studio or class. 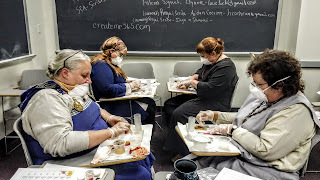 Learning how to be safe allows you to possibly someday advance and create paint from powders that are more toxic than earth pigments such as arsenic, lead, or mercury. Learning preventive basics from the beginning will help later. Overhead view of a student making paint. This class lets you experience making paint by hand using eight natural earth colors. And you get to take your finished paints and safety supplies home to use on your own creations. Whether you use the paint on more art or the preventive supplies to make more paint they're yours. While not the only way to make paint, these natural earth powders when added to a binder were used in Medieval manuscript illumination. And many are still used in paint types to this day. I don't know how fugitive or permanent these paints are. But this was a well-known problem for past artists. Many historic paintings look different today from how they originally appeared. Early artists experimented sometimes unsuccessfully. Leonardo da Vinci's Last Supper is perhaps the most famous. His experimental technique caused it to deteriorate soon after it was created. Creating your own paints is not just fun but an adventure to do. A lesson in art process and materials' safety. It's also a part of history. The repetitive strokes of paint making can be a rewarding, tactile, calming experience. 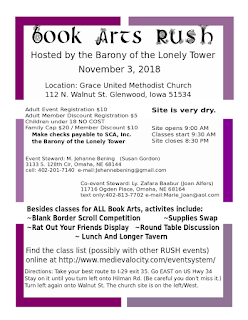 One I hope you will come and enjoy on November 3rd. You can enhance your work by nurturing your visual awareness. Whether you research pixels in medieval manuscripts or notice details in modern pictures you increase your observation powers through constant practice. What do you see in the picture to the right? Is it a duck or a rabbit? 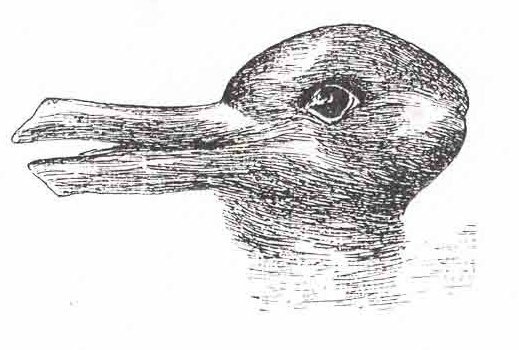 Whether you see a rabbit or a duck may depend on how you believe either should appear. 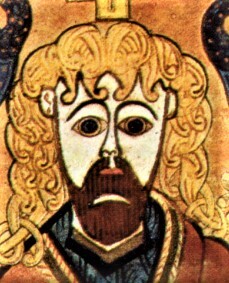 This also happens when you recreate medieval manuscript images, especially faces and hands. We expect them to appear a certain way so we draw them onto medieval people in the scrolls we create. It goes a bit deeper than that. 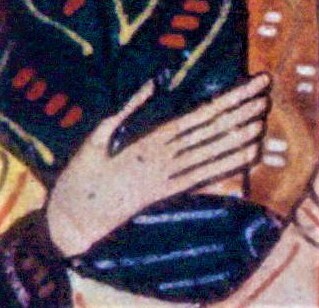 The way Medieval faces, feet, and hands appear in manuscripts vary by era or location, often in the details. Compare the images below. They're separated at least by two centuries and hundreds of miles. What do you see? Do they appear cartoonish or realistic? How many paint layers can you find? What shading and highlighting do you see? How dense are they outlined? 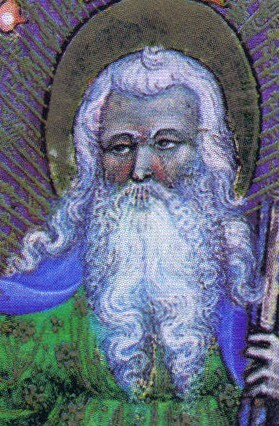 Spanish Beatus, Mozarabic art's best-known works. Looking at medieval illuminated manuscripts strengthens your detail awareness, your "medieval eye". However you do it, these in-depth comparisons are vital to scribal progress. I like how they challenge my expectations and creativity. 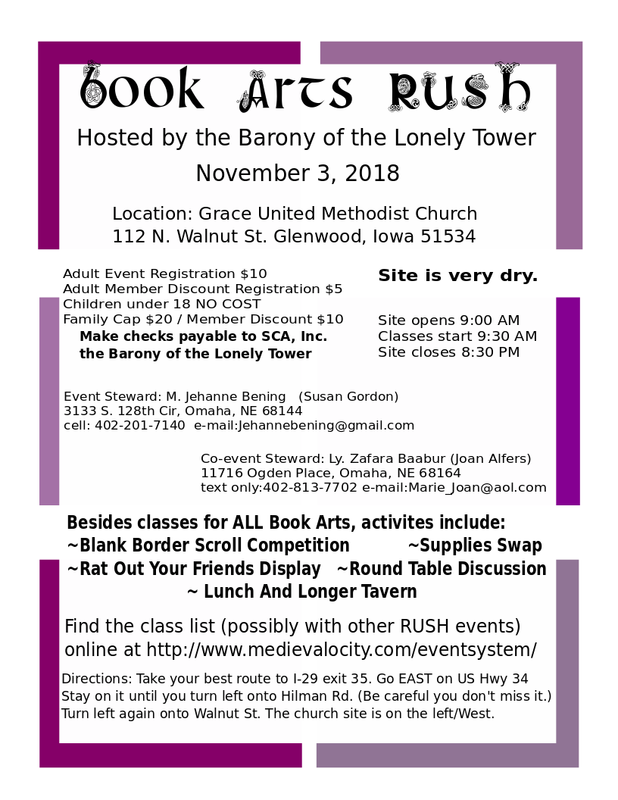 Whether you’re curious, have an interest or an unquenchable passion for Medieval book arts you need look no further than the coming November 3rd RUSH Book Arts Seminar, hosted by the Barony of the Lonely Tower. This RUSH focused seminar offers you classes in bookbinding, calligraphy, illumination, materials and tools preparation, text writing and more. Plans include a “Rat Out Your Friends” display, “Supply Swap”, “Blank Border Largess” competition, and “Round-table Discussion”. Come and you can again be part of Calontir’s active and growing scribal and book artisans community. Immerse yourself in a day filled with paint, glue, ink, and letters. As I work on SCA projects I come across things I think would interest you. They don't always come with pretty pictures like this Milanese rabbit, but I thought as a group you might find them interesting. So I put five together in one post with a similar topic. These blogs are by a variety of professional historians. Although Karen Larsdatter is also in the SCA. I know you'll find them as interesting as I did. And be careful. You might lose track of time or get "hooked" by one or two. History Of The Ancient World gives you "news, articles, and videos about antiquity, from prehistoric times to the Roman Empire." It is edited by Peter Konieczny and Sandra Alvarez who you may also know for the website Medievalists.net – a premier resource for those interested in the Middle Ages. Material Culture Blog where M. Karen Larsdatter "blogs about stuff from the Middle Ages and Renaissance, including clothing, armor, and artwork. News about museum exhibits and new books." Don't miss her showpiece links page where you can click on anything and be amazed. Medieval Histories is another Larsdatter bonanza you won't want to skip. This one is her traditional blog. The Public Medievalist is Dr. Paul B. Sturtevant's unique blog about how the Middle Ages are currently featured in popular culture, museums and in education. You even find posts about SCA culture. Medieval Hungary is a blog written by Zsombor Jékely in English "about medieval art history, with a special focus on Hungary". Jekely started posting in August of 2010 and continues today, but not as often. Even so, it's an interesting blog from a distant part of Europe. So that's the second Internet collection I saved for you. If this is as popular as the first I may do this often. A regular feature you might say. I'm bummed. Calontir's Queen's Prize Tournament is just around the corner, a month away, on September 15th. And I won't be able to go. Queen's Prize is Calontir's Medieval arts and crafts treasure. An event you don't want to miss even if you aren't entering. A competition that's inspiring for us all, whether you're a mentor or searching for a learning opportunity. Intended for new and budding Calontiri, it is a great first Kingdom level competition even if it's your fifth time entering. "Why? ", you ask. Queen's Prize is fun. It's an encouraging friendly competition with built-in positive feedback conversations. If you're new to competitions it offers you a personal friendly critique opportunity. You get to sit with three experienced artisans and discuss your thoughts on your project's process. What you've done and possible ways to take it in the future. If you've entered time and again it offers you a different opportunity. A reason to go outside your creative Medieval arts and crafts box, stretch your Falcon wings and try something completely new to you. It might be so new you don't even have it fully finished, a work-in-progress. A work-in-progress entry offers you a different QPT viewpoint. Intentional or not it includes three others in your creative process. Discussing your work before its finished can give you new direction or remove a roadblock to your effort. It's like having friends over and saying to them "Lookie here. What do you think?" If you've already received an A & S Grant level award, like a Calontir Lily or Silver Hammer, your opportunity is in encouraging others. While you can't actually enter you can inspire and sponsor entrants. Sponsor friends, family, or a friend you haven't made yet. As a sponsor, you might help by coaching, if you're asked. Perhaps with the entry form, loaning necessary tools or advice on the next project step, but without doing the project yourself. You also provide a small gift or favor for an entrant who is not your "sponsoree" so all entrants go home with a prize. I've learned so much just attending Queen's Prize events. The first was upon receiving my Calon Lily and shockingly discovered I could no longer enter. I was actually crushed. And crushed again because I'd already begun my entry for the year. No biggie. I just put it in the judges' group prize basket, a yearly donation amalgam presented to the Judges' Choice recipient. I've done that most years I attend the event. I've also learned there are so many Medieval things to recreate I'll never be able to get to do them all. From Medieval fishing flies and Chinese fake fingernails to common prayer roll recreations. 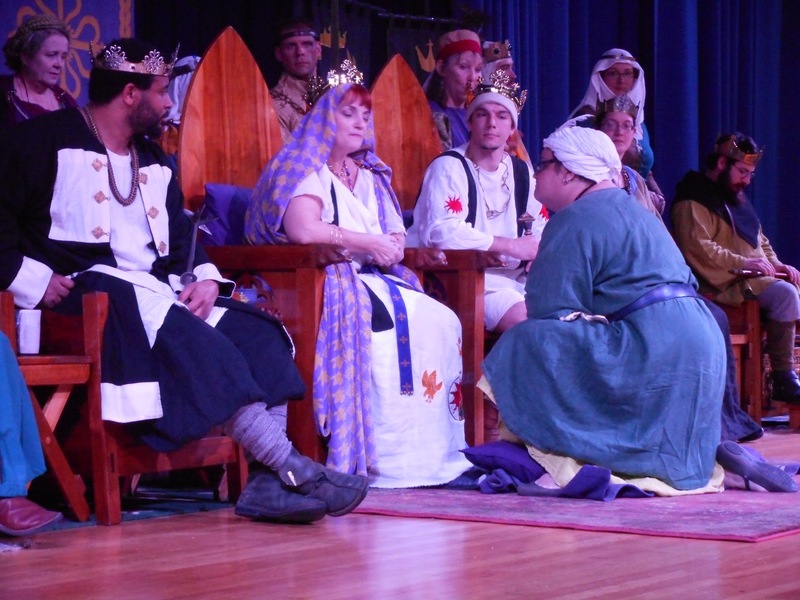 There's much to spark your creative juices at Calontir's Queen's Prize Tourney. Even just looking at the entrants' explorations. They are others' wildest dreams. Calontir's 2016 Queen's Prize Tournament"
Can Jehanne Read And Write? epistle of Cydippe to Aconcius. I've been working through M. Modar Neznanich's Research Questions for Developing a Persona. Recently I hunted for information on number 23. "Would your persona have been literate in your chosen culture/time-frame?" I wanted an excuse for all the writing I do. Yes, even in bed. What about you? Many in the SCA believe in the Middle Ages few people could read or write. So they contrive a persona-story that allows them those skills. But is that true? And what about for women? As expected it depends on the era, status, and gender. If you are curious you might start by looking into Medieval European education. But with a female persona it's easier by simply googling Medieval women's literacy. From there you find intriguing tidbits. The daughters of Emperor Charlemagne (742-814 A. D.) were educated at the Palace of Aachen's school with other nobles' daughters so in their future they'd live up to their social position. But they are early nobility in a central European area. 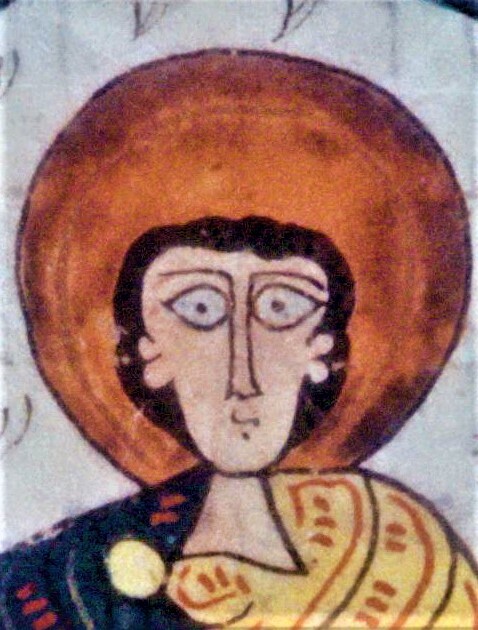 Hroswitha of Gandersheim (935–1000 A.D.) a German secular canoness, dramatist, and poetess. And Hildegard of Bingen(1098–1179 A.D) a German abbess, philosopher, botanist, and writer. After the fall of the Roman Empire, the monks and nuns were the literate. Some nuns even contributing to the era's scholarly research, like the women above. The first universities emerged in the 11th century and women were usually excluded. But with a few exceptions. The University of Bologna let women attend lectures from its beginning in 1088. The physician, Trotula di Ruggiero, sometimes confused with Trota of Salerno. She held a chair at the Medical School of Salerno in the 11th century teaching noble Italian women and writing about women's medicine and cosmetics. We need never lack the pleasures of conversation... Even when separated we could enjoy each other's presence by exchange of written messages. So, from this, you would guess Jehanne could write just to do her job. Jehanne Bening was born in Ghent, the Duchy of Burgundy, April 16, 1439, or possibly 1440, by the Gregorian calendar date. She -or I- eventually became a manuscript illuminator and writer, an apprentice to Sanders Bening. But what about Medieval women in general or was Jehanne special because of her occupation? Despite successes, you still find cultural bias affecting women's education during the Middle Ages. It's difficult to know from recorded history because historians write from their own viewpoint. But women achieved greater significance after the 14th-century plagues. The plagues decimated Europe’s population and workforce. Women then often took on traditionally male jobs. That included the need to read court documents. This encouraged more women to learn to read. But could a woman be an author? 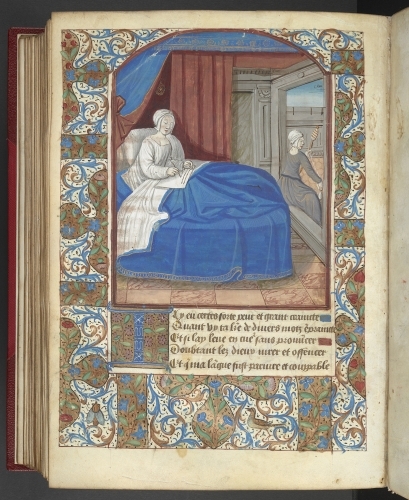 Christine de Pizan wrote the first history book about women from their viewpoint and for women. She argued for women's achievements giving them a positive view. Since Pizan wrote her books for women there must have been educated women to read them. You also see this in the Paston letters. Margaret Paston was the daughter of John Mautby, a wealthy English farmer. When her father died she inherited his land. After she married John Paston, also a large landowner and lawyer, she looked after their large combined estates. When they were separated they communicated by letters. Hundreds survive providing us insight into 15th-century daily life. But the biggest increase in women's literacy came from Johannes Gutenberg's printing press in 1450. His printing press both caused and resulted in a widespread literacy increase. All things considered, Jehanne could read and write. Her time, place and occupation show she could. More specifically, this is mentioned in the book Illuminating the Renaissance: The Triumph of Flemish Manuscript Painting in Europe. What about you? No cheating now. Would your persona be able to read and write? Where would you look for that information? External Related Sources: You can find an extensive list of works by and about Medieval women writers on Fordham University's Internet History Sourcebook.